"Making the decision to get away from violence while physically trapped in a foreign country, Paula quickly learned her American freedoms had not traveled with her. These pages draw readers deep into her experience, and we witness her intuition carrying her through. Just when we think she is safe, the story turns, and she is on the run again with her three sons. It's an unforgettable memoir, and a teacher for us all." "Paula Lucas escaped with her sons from desperate circumstances and with incredible will and resourcefulness became an internationally respected leader in victim advocacy. Her work and the organization she founded is a lifeline for countless abused women and men around the world who find themselves alone or isolated in unfamiliar surroundings. In Harvesting Stones, this extraordinary woman shares her personal story. Much more than a cautionary tale, it's an inspiration and a model for anyone who seeks to transform their lives and help others in the process." Terrifying, unimaginable, harrowing, chilling - thankfully this engrossing book ends triumphantly. Paula Lucas' cautionary story of survival is the stuff of news headlines, full of international intrigue, betrayal, domestic violence and virtual servitude in a foreign land. Barely escaping with her sons, she helps them heal while on the run from her abusive spouse, and despite poverty goes on to create the much-needed Americans Overseas Domestic Violence Crisis Center to aid others in similar straits. Harvesting Stones is a testament to Lucas' strength, bravery, tenacity and will to thrive. Her tale is the very hallmark of resilience. "I held my breath reading this book. I didn't dare to breathe until I knew that Paula and her boys would be safe. I don't know how Paula managed to keep going. I can't imagine the amount of fear that must have raced through her veins. What an inspiring, amazing women, facing such diversity only to then turn around and help others in similar situations. 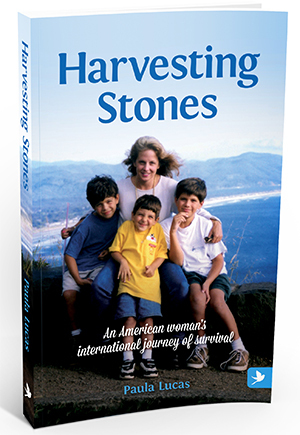 Harvesting Stones is a book that needs to be read by as many people as possible. This book is not only the story of a courageous women it is also an education, offering insight on how can we help others in similar situations. This book is a wake up call to what could be happening around us and among our friends. Things are not always as they seem. I am convinced that this book will save lives." Harvesting Stones describes one woman’s descent into an inferno of violence with escape complicated by her living in a foreign country. Hats off to Paula Lucas, who then created the Americans Overseas Domestic Violence Crisis Center, a ground-breaking U.S.-based nonprofit association with a solid global safety net to help abused Americans abroad. Paula has done a masterful job in recreating the agonies she and her sons suffered at her husband's hands and the frustration and pain of her seemingly helpless situation. Finally, she was able to escape to the United States, only to be confronted by him again. Her journey from an abused wife and mother to a beacon of light to other women who find themselves in similar situations overseas through her Americans Overseas Domestic Violence Crisis Center is both riveting and an example to others showing the power of one individual who is determined first, to save herself and her children, and second, to provide the help she was denied to others. Paula Lucas takes us on a journey into an expat marriage with a shockingly abusive man, her plight compounded by the circumstances of her vulnerability. Scalps will tighten as she is terrorized along with her three boys and discovers they are unable to flee. This is not a book to put down and forget. In the voice of your close friend, Paula Lucas shares her shocking unimaginable personal story - of domestic abuse in an exotic foreign land, of a mother's strong will to survive for her children, and of a woman's determination to rise above her fate to help others. Paula Lucas' story highlights the special challenges faced by Americans living overseas who are victims of domestic violence. She founded the Americans Overseas Domestic Violence Crisis Center to help others in the same situation. Hers is an enthralling story of courage and perseverance with a powerful and inspiring ending. The "harvest" Paula continues to make of the many stones that almost buried her and her sons in Dubai is now saving other women and children every day. Her story, that might simply have read like a good thriller (which it does), is far more powerful because it is the true story of one woman, stranded with no natural support network in a life-threatening situation, turning misfortune and near disaster into a fierce mission.